The Year of the Dragon is upon us, and the King has chosen to celebrate the Lunar New Year in high style. Rare mice have been spotted, and some of them have even dressed up for the occasion. As the celebration grows louder, only the bravest will remain. Join us for the celebration! 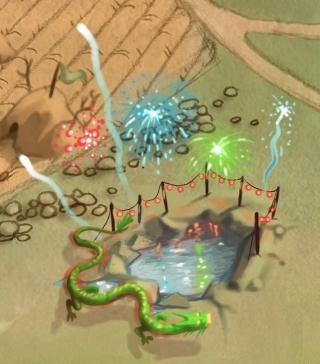 The Year of the Dragon Festival is a special location available exclusively during the 2012 Chinese New Years event which requires a minimum rank of Recruit to enter. Mice are unable to steal gold or points in this location but may steal cheese if not caught. Catch statistics from the Year of the Dragon Festival are grouped with those from the Festive Comet under the King's Party Zone location name. The Year of the Dragon Festival is currently closed. The King's Guards kindly escorted me to the Meadow so that I may resume the hunt. 1 Only Journeyman and above can use charms. 2 Only available starting January 31, 2012. The Year of the Dragon is upon us this Lunar New Year, and with that comes the Year of the Dragon Festival! The King has re-opened the Vacant Lot to hold a grand celebration for this year's Lunar New Year, and we want all hunters to attend! Many rare mice have been spotted there already, and even some costumed mice have joined in on the celebration. This year, the King wants an even louder and grander celebration. He ordered hundreds of crates of Firecracker Charms so that hunters could celebrate in their own way, but the pesky mice at the festival got into the supply! The charms have been scattered across the festival grounds. The King has instructed hunters to hunt down these mice and to light and ignite any and all Firecracker Charms they may find. This will bring out even more of the costumed mice and reveal where they've hidden the grander explosive fireworks. Find the Dragon Breath Charms and put on a truly magnificent display to make this a spectacular Year of the Dragon Festival! This page was last edited on 12 May 2015, at 16:42.